Betting Over Under (also known as totals) is a very big part of our hockey handicapping. In this article, we’ll give you 3 tips from the NHL over under betting system we’ve developed over the years. But first, let’s explain why we love betting NHL Over Under. Since nearly a quarter of NHL games are decided in overtime or shootouts that are virtually impossible to predict, betting NHL Over Under can remove some of the randomness and variance from the results. After all, even if a game goes to OT or a shootout, you know that only 1 more goal will be scored in the game. In other words, the result of the OT or shootout won’t determine the result of your wager – which can be huge for your peace of mind. In addition to being easier to project (in our opinion) and therefore profitable, betting NHL over under is also fun. Especially if you play Overs – because who doesn’t love cheering for goals? Like the popular saying goes, it ain’t over until it’s OVER. Alright, let’s get into our NHL Over Under betting system. It took several years of regularly betting NHL totals before we settled on 3 main principles that we stick to as part of our NHL over under betting system. A pretty common mistake we notice in people’s NHL over under betting strategy is looking at averages of how many goals a team has scored or given up per game over the season, or even over a recent stretch of games. The problem with that approach is that outliers (extreme results) can skew those averages in a way that doesn’t accurately reflect what that team’s real tendencies are. 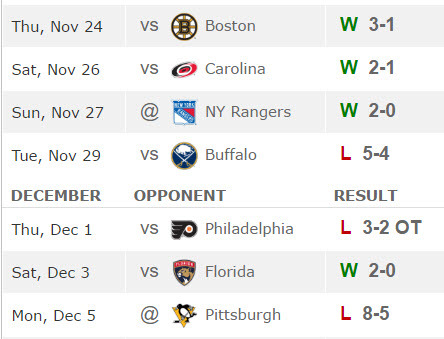 For example, check out this 7-game stretch of results for the Ottawa Senators in 2016. If you were to add the number of goals scored in those games (38) and divide them by 7, you’d see there’d been an average of 5.43 goals scored in that stretch. So if Ottawa was playing in a game that had an Over Under of 5, you might conclude that the Over would be a great bet because the last 7 Senators games were averaging nearly half a goal more than 5. However, look at the outliers. Two games accounted for 22 of those 38 goals (5-4 and 8-5). Take those out of the equation and the other 5 games had an average of 3.33 goals scored. Not exactly the type of team you want to bet Over with anymore, is it? We’re not saying ignore those 2 high-scoring games completely. But try to limit the weight that those outliers carry in your handicapping. Instead of totalling the number of goals for and against in those 7 games to come up with an average, we suggest looking at how many times the Senators scored 3 goals or more (3 times in 7) or allowed 3 goals or more (3 times in 7, and only twice in regulation). Since a team needs to either score 3+ or allow 3+ (or both) for a game to go Over 5, you can see that the Senators weren’t doing that with much regularity over that 7-game stretch – making them more of an “Under team” than “Over team” in that short sample size. #Leafs are scoring 3.42 goals per game at home (second in the #NHL). On the road, they’re averaging only 2.08 (26th in the NHL). Winning percentage isn’t the only thing that drastically changes when teams are at home or on the road. It’s also quite common to see teams play completely differently at home than they do on the road. Some teams might feed off the energy of the home crowd and light up the scoreboard in front of their own fans, but be more conservative and defensive-minded on the road. Others may feel a bit tight in their home rink and try to do too much, but relax on the road and play a looser style. The Edmonton Oilers were a perfect example of the latter in the first half of the 2016-17 season. Through their first 52 games of the campaign, the Oilers were averaging a very healthy 2.9 goals for per game. However, simply relying on that stat wasn’t a good NHL Over Under betting strategy because of the huge disparity between their home and away numbers. Edmonton’s goals-against averages at home and on the road were actually pretty similar. But that difference of 0.76 goals per game on offence had a huge impact on the Oilers’ Over Under trends over those first 52 games. The Oilers’ struggles to score at home – for whatever reason – basically made the Under an auto-bet when they played at Rogers Place, especially if the total was 5.5. Put Edmonton out on the road, however, and the Over was one of the first things we looked at. 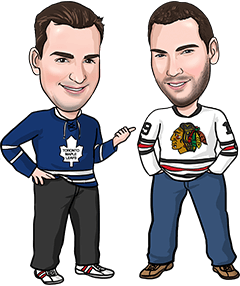 In a previous article we wrote about the huge difference between Over 5 and Over 5.5, we listed 3 points about why 5 and 5.5 are such key numbers in NHL Over Under betting. We basically stopped betting Over 5.5. Like any rule, there are exceptions to this. But it takes an awful lot for us to bet Over 5.5, since it either requires one of the teams to score at least 4 goals (possibly more, if the other team scores 1 goal or less) or both teams to score at least 3. Instead of betting Over 5.5, we turned our attention towards Team Totals, which are almost always posted at 2.5. Odds on a Team Total Over 2.5 (especially the favourite) won’t pay as well as the odds on the Over 5.5, but it’s much more likely that one team will score at least 3 goals in a game than that both will. If you like there to be at least 6 goals in a game (which you’re essentially doing by betting Over 5.5), we suggest looking at the underdog’s Team Total instead. You’d likely need them to contribute a few goals to the scoring in order for the game to go Over 5.5 anyway, and you might be able to find the underdog’s Team Total Over 2.5 for close to even money, especially if the game is a bit of a mismatch. And if the game’s a big mismatch and you expect the favourite to put up at least 4 goals in the game, you might be able to find a Team Total Over 3.5. Those almost always pay plus money (often in the neighbourhood of +150 or higher). You’re going to need one of the two teams to score 4 goals or more to cash the Over 5.5 anyway, so why not take a shot at a much better payout? Another alternative is to bet the Over 6 or even Over 6.5. You’ll get a better payout, and a lot of games that go Over 5.5 end up going Over 6 as well.